Plagued by loneliness, eight year old John Bennett (Mark Wahlberg) makes a Christmas wish for his teddy bear to come to life. When it does, John transforms into the happiest boy alive, and the teddy bear becomes somewhat of a minor celebrity. However, as years come to pass and John finds himself in a position where his girlfriend Laurie (Mila Kunis) wants more from their relationship, he’s forced to make some life-changing decisions regarding his life, and his pot-smoking, party loving best friend Ted (Seth MacFarlane). The feature film debut of Family Guy creator and mastermind Seth MacFarlane is a promising one, but sadly not one that knocks it out of the park like many – myself included – had hoped. 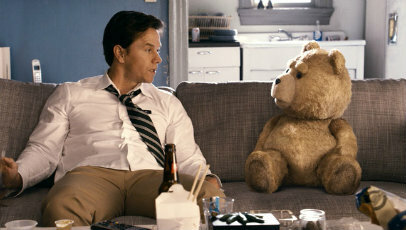 With a script penned by MacFarlane himself (with help from frequent collaborators Alec Sulkin and Wellesley Wild), Ted sticks very closely to the intermittently funny, repetitive formula he’s become synonymous with over the years, to such an extent that ensures the film never quite hits the heights promised by its high-concept, oddball premise. As it constantly chops and changes between a variety of different tones (from no-holds-barred, untamed comedy to a slightly unsetting kidnapping subplot involving a crackpot single father and his disadvantaged overweight son), it’s surprising to say that it’s at its most enjoyable and rewarding when focusing on the sweet, often misunderstood life-long relationship between Ted and John, and how John struggles to move past his childhood and establish a normal, mature and stable life with longterm girlfriend Laurie. That’s not to say Ted’s entirely devoid of laughs, as it’s not. From hotel room brawls, an incident involving excrement, a scattering of notable cameos that you wouldn’t want spoiled and an inspired narration by someone embedded within the MacFarlane universe. It’s mostly that MacFarlane doesn’t know what he wants the overall message to be, which not only limits how much audiences are willing to invest, but also stops Ted having the kind of impact it should. His other responsibilities aside, MacFarlane does well to award Ted with a distinct personality and welcomed humility – one that’s different enough from his cavalcade of other cartoon characters. This is achieved both through his tiptop voice performance and the motion capture element, which adds a nice depth to what’s essentially a talking cuddly toy brought to life by a boy’s wish. Wahlberg and Kunis provide decent support, each fleshing out their performances in ways that make John and Laurie as essential to Ted as the bear himself. Ted is a crude comedy, but not exactly the one you may be expecting. Though funny, with some excellent performances and set pieces, the elements don’t add up in a way that’s either consistent or entirely rewarding and worthwhile. But, when compared to other comedy vehicles from more established filmmakers, MacFarlane has succeeded in his transition from TV to cinema, and created a solid foundation with Ted that shows there may well be life beyond the tired and sagging likes of Family Guy and The Cleveland Show.